Photo to the left: Dicey won’t let go of my finger; she wants me to stay with her. This is a far cry from her behavior when she first came to me viciously aggressive. I adopted her and her sister, Pemy, from a rescue (they had been considered unadoptable) to see if I could help them become friendly. Whenever I think about what to do with a rat, I translate the situation into human terms, and consider what to do. Human examples can help: If the 4-year old child is afraid of dogs, would I insist she go into a room with a friendly dog, when she does not want to? The thinking is that with exposure she will ‘see’ that there is nothing to be afraid of. What if she begins to cry and clings to the door, what then? Another example: A stranger approaches a child, looms over him, and says, “Come with me, son”. The child cringes and looks worried. These approaches are not helpful for respecting a child’s feelings, and in fact they can create new fears, or worse fears. The parents take the child to the park where, from a distance, she watches friendly dogs play. At a friend’s home, from the other room, she watches kids play happily with the sweet family dog. The dog happily lies down on his back and wags his tail while the children rub his belly. From 5 feet away, the scared child considers whether she would like to move a little closer. The stranger stops 20 feet away from the 5-year-old, and makes eye contact. Smiling reassuringly, he says, “Hi, son, I’m the coach, and we’re bringing out the basketballs. Would you like to join the team?” The boy considers, likes the idea, and moves to join the coach. Feel this in your heart; feel your rat’s heart, too. 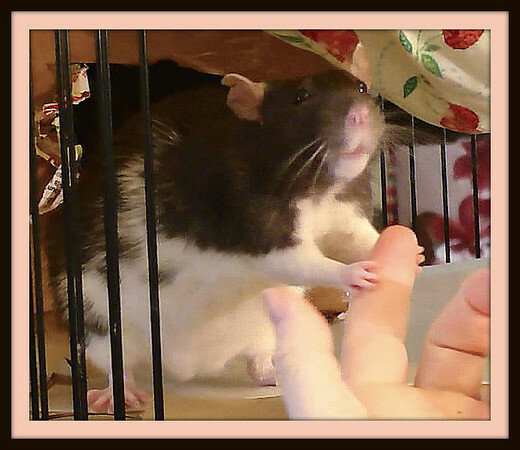 How do I think about the heart – the soul, the compassionate core – of what it means to affect the behavior of my rats? What do I want to happen to rats who are learning? What is at the heart of learning and affecting the behavior of any animal? To optimize learning for any animal, minimize stress. For the most part this means helping them remain calm and relaxed. 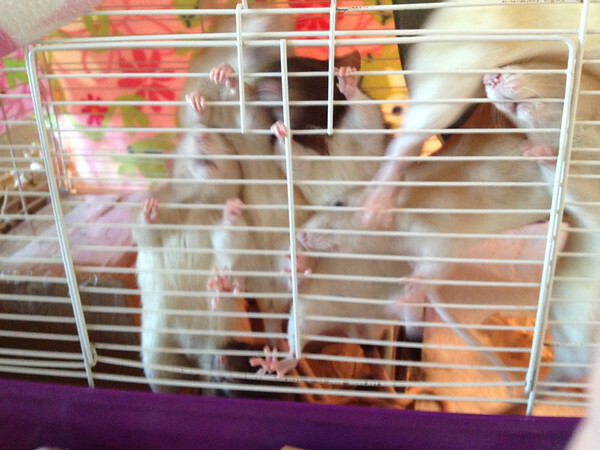 I want my rats to want to learn. To want to try for me. To enjoy trying for me. I want my rats to be happy, deeply happy. I want my rats to trust me. TRUST is a big category, so I’ll leave it simple for now. 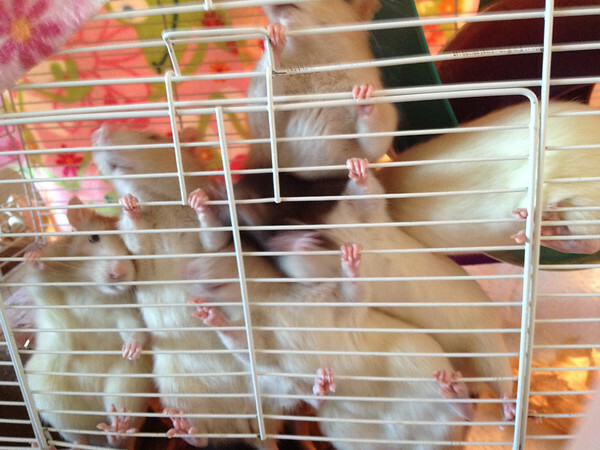 I want my rats to have the time they need to go through any learning process. If it takes several weeks to introduce a rat to a rat, I will give that rat that time, even if it means more work for me. I want my rats to have an easy road, not a hard road. I won’t ask too much, too fast. If my rat gives me a sign of holding back, or evading me, or worrying about something, something is wrong, and it’s on me to figure out and fix the problem. My rat deserves to get something out of learning. Something she or he likes or wants, from his or her perspective, and not something I think s/he should like. With the exception of emergencies, I will never make my rat do something “because I said so”. I want my rats to experience me respecting their feelings. I can ‘see’ their feelings of worry, fear, anger, desire, want, dislike, like, and all feelings in between, in their body language. I don’t override, ignore, or push past their feelings. I work to help my rats come around to try what I’m asking of them with a happy attitude. Things like gloves or “neutral carriers” are not in and of themselves techniques. 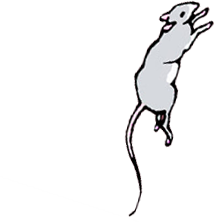 Read more about Gloves, Rat-Rat Introductions, and Science, in, Techniques to Introduce Rats to Rats — Means – What, Exactly? I want my rats to experience me respecting their opinions as I ask them to do something. I can ‘see’ their thoughts in their behaviors, in their body language of “No”, “Yes”, “Maybe”, “I don’t know”, and everything in between. I don’t override, ignore, or push past their opinions. I work to help my rats come around to try what I’m asking of them, with a “Yes” or “Okay” opinion. Everything I do aims to prevent aggression from happening, ever. Whether the aggression is from a rat to a human, or between rats. I fervently care that my rats not suffer trauma. No emotional, psychological, or physical abuse. All of the above are embedded in modern behavioral modification science. That is the science of Respondent Conditioning and Operant Conditioning. The methods in this science can help achieve everything in the list! Cool, huh? What is the heart – the soul, the compassionate core – of what it means to affect the behavior of rats? The body language of these rats: Yes! Want! Want Out! Want to go to you!